Memorial Day to most of the nation means the start of summer, backyard barbeques, and family vacations. To children it’s the end of the school year, the chance to head to the beach, go rafting or other outdoor activities. For few Americans it’s the long painful walk among the thousands of white cross’s that span the generations of conflicts this nation has endured. Until they come to the cross that marks the final resting place of a husband, mother, father, brother, sister, son or daughter. Reflecting on what was to be, each dream ending, enabling our dreams to begin. Many of the fallen were fresh out of high school thrust into the eternal struggle between good and evil. Futures ended, going to college, dreams of family, marrying their high school sweet heart all ended; the families of the fallen have to live the rest of time contemplating a life taken before it began. A young mother who takes her children to pay respects to a father they only just had a chance to know. The wife standing over the eternal resting place of the man she hoped to grow old with, silently praying for the strength to raise their children alone. This Memorial Day again, we commemorate at a time of great conflict when America’s treasured youth are again in far off lands determining whether the world lives in peace or darkness. From the birth of this republic, the foundation of this country was the proposition that all men are created equal, that people from the four corners of the world risked all to reach the promised land of freedoms shore. It’s instinctive to understand why so many brave men & women are making the ultimate sacrifice to look back and recognize that freedom isn’t free and great men before us gave everything so we might keep the torch of liberty burning for humanity. The hand of providence has guided and placed its undisputed mark on this country. Our eternal father gave us life, but he also gave us liberty to pursue the freedoms that enable us to be free in thought, spirit, and purpose. The founding fathers in their enlightened belief, nothing that had the undisputed mark of our creator was placed on this earth to be enslaved and terrorized by its fellow man. The gift of freedom is not exclusively an American birthright but a gift to humanity from our benevolent creator. His hand has been placed on this nation; a place where freedom dwells. If we lose freedom here there will be no place to escape to, this is freedoms final stand. History teaches us that man in his unquestionable thirst for power and glory will strive to subjugate the freedom and liberties of humanity. America to many is a monolithic giant bent on dominating others, but to those struggling to break the bonds of slavery, America is the last hope of a subjugated people. America has a rendezvous with destiny, a nation set forth by providence to be the watchman that keeps the clouds of darkness from enslaving mankind. Tom Brokow wrote that the generation that endured the economic upheaval of the great depression, entered a world engulfed in global conflict, emerged as the “greatest generation” for having secured freedom not only for us but for a suffering humanity. Now a new generation of Americans has accepted the mantel from that gallant era, and has emboldened on a quest to secure those same freedoms for those suffering to break the bonds of mass misery. Pausing to reflect this Memorial Day, let’s take the time and remember those who sacrificed for the cause of freedom who have never come home that lay in the battlefields across the globe. In the last century their lives ended in places called Belleau Woods, the Aargonne, Omaha Beach, Salerno, and half way around the world on Guadalcanal, Tarawa, Iwo Jima, Pork Chop Hill, the Chosin Reservoir, and hundreds of rice paddies and jungles of Vietnam. In our lifetime they fell in the Persian Gulf, Somalia, the mountains of Afghanistan, Fallujah, Nasiriyah, Ramadi, and on the streets of Baghdad. Arlington Cemetery in Virginia holds the final resting place of many men and women whose lives had yet to begin. The tomb of the Unknown Soldier holds the remains of four service members known only to God. 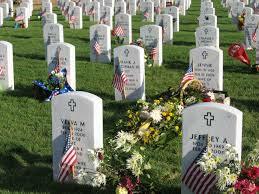 They all gave the greatest sacrifice of all; their lives so we as Americans can live free as our creator intended. Let’s not forget those missing American’s who’s ashes our scattered to the four corners of the earth, whose families know not where they lay but only a loving father in heaven. The fallen are not just names gracing the page of a newspaper or read aloud, but someone’s father, brother, husband, daughter or son. They all sacrificed defending the values that this republic stands for and millions around the globe yearn for; freedom. The faith of the men and women in uniform has never wavered in its devotion to this nation, but at times America’s trust in its sons and daughters has not always been resolute. Martin Savidge of CNN, embedded with a battalion of Marines during Operation Iraqi Freedom was talking with four young Marines near his fighting position that morning live on CNN. He had been telling the story of how well the Marines were looking out for and taking care of him since the war started. He talked about the many hardships the Marines had endured since the war began and how they all looked out for each other. He turned to the four and said he had cleared it with their commanders; they could use his videophone to call home. The nineteen year old Marine next to him asked him if he would allow his platoon sergeant to use his call to call his pregnant wife back home whom he had not been able to talk to in three months. A stunned Savidge who was visibly moved by the request nodded his head and the young Marine ran off to get the sergeant. They have always been there! America has heroes today; they are in the uniform of the armed forces. Men and Women who serve to protect the nation willing at a moment’s notice to go into harms, to tread where others fear to go, all for the protection of others. Whenever this nation has been threatened, whenever freedom needs protecting they rise up like the wind sweeps across a meadow. Coming from all corners of this vast country from; the eastern seaboard to the Florida panhandle, to the wide-open prairies, to the vast pacific northwest, and to sunny shores of California. Coming from different cultures and social-economic and religious backgrounds, they were bounded in belief that if they faltered freedom would slip from humanity’s grasp. The past century has been known as the most destructive in human history, the American serviceman has defeated fascism, communism, and now is engulfed in the struggle to ride the world of global terrorism. Freedom has a different meaning to those who escaped the tentacles of enslavement. The story of an immigrant from Eastern Europe comes to mind, she was born in the Ukraine in 1924, and the Soviet regime sent her parents to Siberia never to see them again. Famine engulfed Ukraine after Stalin came to power, millions perished including her sister; she was then placed in an orphanage. During World War II she was sent to a German labor camp, after the war ended she made her way to America. Finally the first time in her life, she felt valued as a human being. My father’s aunt who passed away at 102 in Italy, never stepped foot or smelled its sweet pure air of liberty of America, but she knew firsthand the power of America, and the compassion she can bestow. For she witnessed the arsenal America brought to bear to secure the peace. Then used its vast wealth to uplift a down trot ten world, and kept that peace. The pride of this nation many barely out of high school, never thinking of their own welfare only pulling a brutal dictator from his hole and an entire nation from darkness. America has never had any territorial ambition only to live in peace and harmony in the family of nations. The Italian prime minister Silvio Berlusconi stated “the only territory really occupied by the United States is that in which the soldiers who died for our freedom, lay,” he said, a reference to American cemeteries in Europe. As we reflect this Memorial Day let’s remember we are again in a great conflict that will determine whether our children live in freedom or face a world void of liberty. Let’s remember those fallen individuals who gave the supreme sacrifice that we can enjoy the bountiful harvest and blessing of this choice land. Let us not forget! If we ever forget we will see this beloved land scattered to the winds and placed on the ash heap of history’s fallen nations. Let’s remember the fallen this Memorial Day; it’s the least we can do!